Hi there! Since it’s end the of August, it’s time for my monthly favourites post – aka Mrs Strawberry Blonde’s August Beauty Awards. 🙂 I’m also making one change to my monthly favourites. From now on I’ll be choosing my favourites from all the products I’ve written about during the month. This way I don’t have to keep track of what’s really new in my stash and when I’ve used what. I think it’ll also make more sense with products I’ve been using for longer – i.e. I like to use certain products for a few weeks to see if and how they work, and then I write about them. OK, that’s sorted then. 🙂 And now, let’s get to my monthly favourites! Even though the serum has its flaws, I’m happy with the results it helped me achieve. I will definitely continue to use it and I will – without doubt – repurchase it. It will become a beauty staple! I cannot recommend this face mask enough. Within only a few weeks this face mask made a huge difference to my skin’s overall appearance. I’ll definitely continue to use it. And as soon as there’s another half price or BOGOF offer, I’ll stock up! 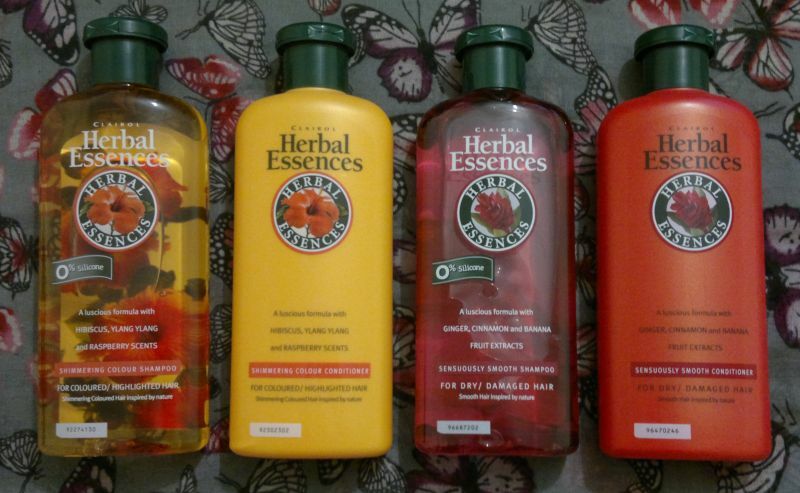 I cannot praise the original Herbal Essences collection enough. It’s bottled magic. It’s a shame the relaunched Rainforest Flowers collection has been discontinued again. 😦 I do have a few shampoos and conditioners left (needless to say I stocked up in time), but one sad day they’ll be gone… So if you see any of these Rainforest Flowers products in a bargain store near you, just buy them! You won’t regret it. Now to the honourable mentions! Other products which I’ve enjoyed (and which I’ll continue to enjoy) big time are Original Source’s Liquorice and Mango & Macadamia shower products and Garnier’s Peach Body Lotion. What are your favourite products this month? Have you used any of the products I’ve used? Feel free to get in touch. And thanks for reading! Hi there! I haven’t reviewed any body butters or lotions in a while – that’s because I’m currently trying to use up all those part-used products that have piled up. When I used this gel cream for the first time, I found it incredibly sticky – for about a minute. But once my skin had absorbed the moisturiser, it just felt great. So whilst my skin felt smooth and supple, it didn’t feel like it was slathered in moisturiser just minutes ago. Brilliant! I also think the soft peach fragrance is quite pleasant. It’s nothing special, but I think it’s the perfect fragrance to go with the gel cream theme. It’s obvious that I’m happy with the product. So yes, I would definitely recommend it. 🙂 I will continue to use this moisturiser over the coming weeks and months, and I might even pick up another bottle. If you’re interested, you might want to swing by your local bargain store to check if they have it. Oh, and this product is a real bargain. I paid £1.49 for a 250ml bottle – amazing value! Hi there! Today’s post is about two Radox shower gels I picked up at a bargain store – Radox Brazilian Fusion with dragonfruit and camu camu berry, and Radox Eastern Spirit with lotus flower and orange blossom. Radox Brazilian Fusion with dragonfruit and camu camu berry is more of a shower cream than a shower gel. My dry skin loves it! But the fragrance isn’t what I expected. I thought it would smell somewhat tropical or exotic, but it’s more like an old-fashioned white flower fragrance. I do like it, but I don’t love it. And obviously this shower gel isn’t as ‘summery’ as I’d hoped. Radox Eastern Spirit with lotus flower and orange blossom is just as I remember it. 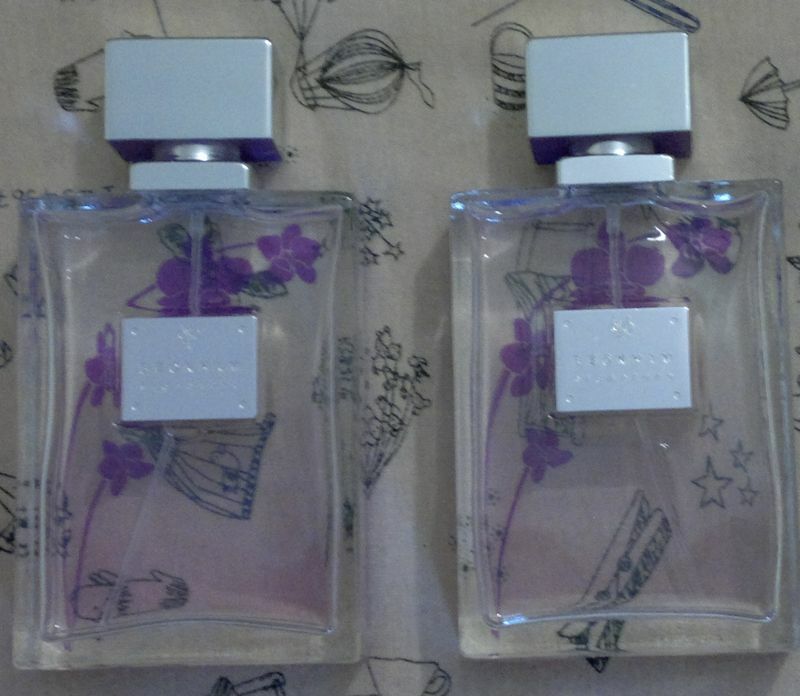 I really like the feminine and exotic floral fragrance. It’s lovely. And just like Brazilian Fusion, Eastern Spirit is more of a shower cream than a shower gel which is very nice! 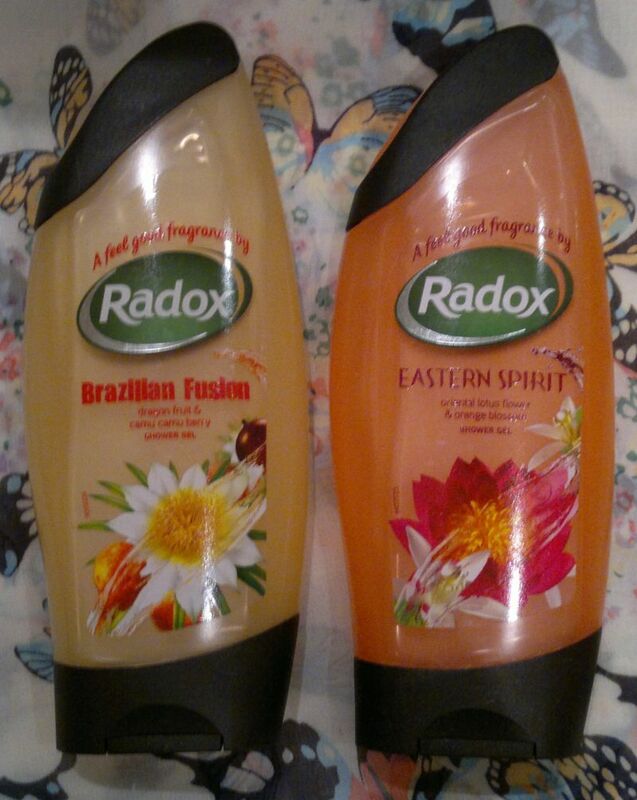 Whilst I’m not entirely sure about Eastern Spirit (aka Radox Feel Enchanted – which I spotted at my local Sainsbury’s store very recently), I’m pretty sure Brazilian Fusion has been discontinued. But I reckon quite a few bargain stores still have it. I bought both shower gels for £1 each (at my local Poundstretcher store, I believe). For this mani I painted my nails with Nails Inc. Chelsea. This polish is a very dark black cherry shade. It’s almost black. And I can’t blame people for thinking Chelsea is a black polish. Since the dark colour started to bore me just minutes after I’d painted my nails, I decided to stamp again. I chose Pueen’s 93 stamping plate (from Pueen’s Buffet Leisure collection), and I opted for a large floral image which I stamped on with the most wonderful (light) blue non-stamping polish that stamps perfectly – Orly Snowcone. It’s a gorgeous polish, isn’t it? I’m very happy with this mani. 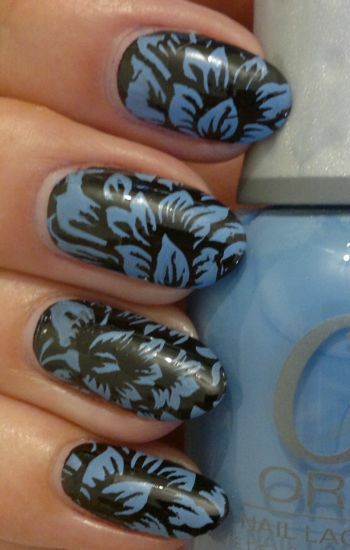 I just love the blue images – the floral pattern is pretty and the blue polish looks so fresh! Do you agree? Feel free to let me know what you think. 🙂 And thanks for reading! But before we get to the review, let me tell you what this serum is supposed to do. First of all, this serum is aimed at women who want to tackle skin ageing and skin impurities at the same time. This serum contains spot-fighting salicylic acid, anti-shine cimicifuga, and lactic acid, phytoprotein and polyglycan – three ingredients which are said to have anti-ageing properties. Then I started to use this serum on my make-up free days (= my two homeworking days and stay-at-home Saturdays or Sundays) and generally at night time. Whilst I haven’t seen any improvement in the appearance of my fine lines, my skin looks a lot clearer. Whilst I think Superdrug’s Glycolic Peel-Off Mask deserves most of the credit for this, I’ve noticed that the serum definitely contributed to my skin clearing up (chin, nose) – especially now that I’m using the glycolic peel-off mask once per week only. There are two more things I’d like to mention. 1. This serum doesn’t smell great. It has a chemical smell. But it’s nowhere near as smelly (or as intense) as its sister product, Superdrug’s Clearly Youthful Cream Cleanser. 2. When I use this serum after I’ve used a face scrub, I can feel a stingling (= stinging and tingling) sensation on my face. It goes away quickly, but (if I remember) I try not to use the serum after I’ve given my face a scrub. 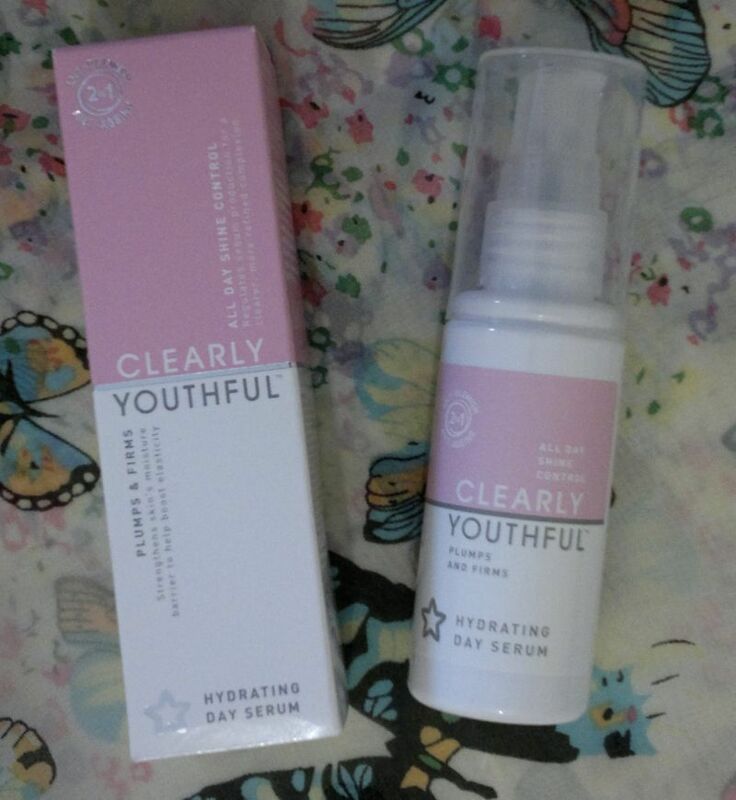 All in all, I would recommend Superdrug’s Clearly Youthful Hydrating Day Serum if you’re looking for a product that helps fight skin impurities. I’ll definitely buy this serum again – even though I have to limit myself to using it on make-up free days only. In case you’re wondering, I bought the serum when it was half price (£2.39) about two months ago. But even at full price, the 50ml serum is £4.89 only, so it’s very affordable! I’ve also just started to use the matching night serum. Of course I bought that one too. 🙂 I’ll let you know what the night serum’s like in a few weeks. In the meantime, feel free to let me know what you think of Superdrug’s Clearly Youthful products. Have you tried any of them? Or would you like to try them? And thanks for reading! Hi there! 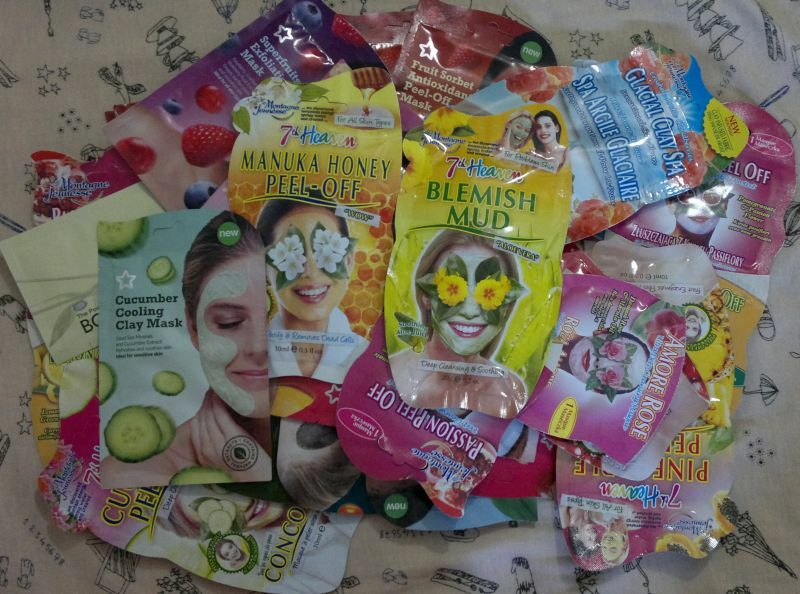 If you read Monday’s post, you know that I’ve got a ridiculous amount of face masks. But I’m tackling my stash by using one mask every four to six days (as usual) – and by not stocking up on any more face masks (that’s new). Today I’m telling you about my experience with Montagne Jeunesse’s Passion Peel-Off Mask. First of all, this mask is available for around £1. But I found Montagne Jeunesse face mask duos (yes, that’s two masks!) at Poundland (where the Passion Peel-Off mask is teamed up with the brilliant Lemon Zest mask). But back to the Passion Peel-Off Mask. The first thing I noticed is that this mask smelled exactly like Superdrug’s Fruit Sorbet Antioxidant Peel-Off Mask. So I checked the ingredients of both face masks, and I found the first third (or so) of the listed ingredients is the same for both masks. Sure, the proportions may be different, and there are certain ingredients (i.e. polyvinyl alcohol) which can be found in all these peel-off masks. But since I’ve never actively compared ingredients, I was a bit surprised by how similar these masks are. 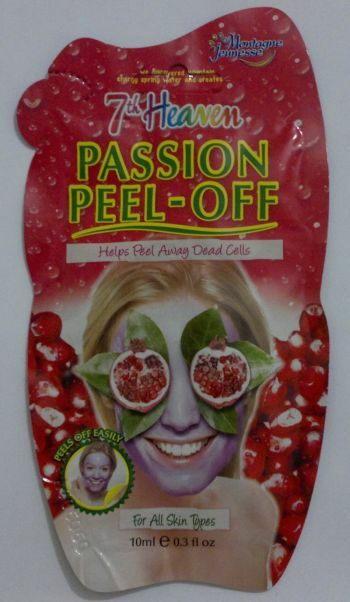 However, I’ve noticed that Montagne Jeunesse’s Passion Peel-Off Mask was considerably less runny than Superdrug’s mask. So Montagne Jeunesse’s mask was easier (and less messy) to apply. I think this is another very nice face mask from Montagne Jeunesse. And I’d definitely recommend it if you’re looking for a fruity peel-off mask. Another plus is that this mask is suitable for vegetarians, and that it’s BUAV-approved – it carries the Leaping Bunny logo which means this product is cruelty-free! 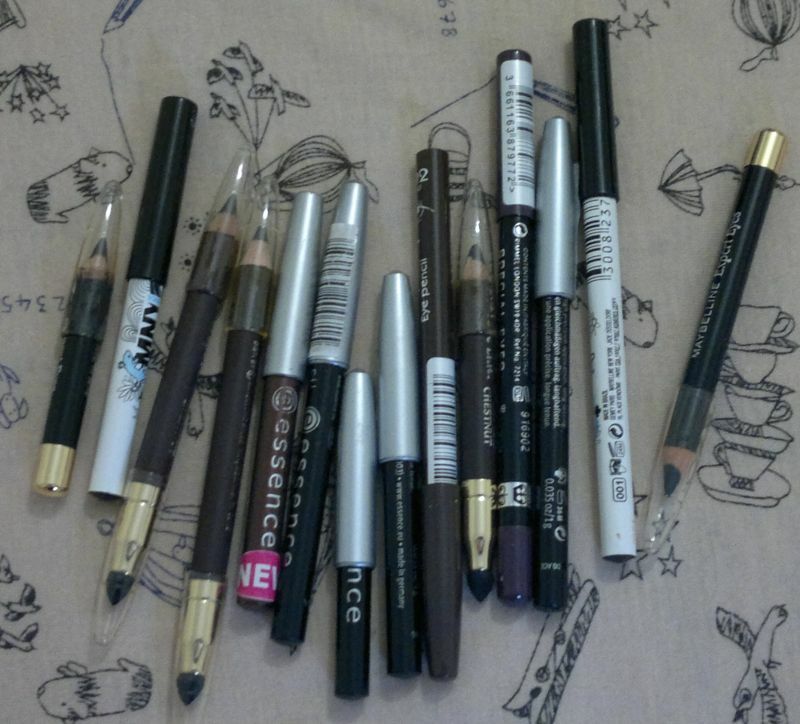 2 If you think this is my eyeliner stash, guess again. These eyeliners are only the ones I’m using at the moment. Yes, I’ve got several eyeliners in a rota! And I’ve got a few more in my handbag… I admit, this just came about because I was fed up of sharpening the pencils all the time, and I thought it would be better to use several eyeliners and to sharpen all of them in one go every other week. I think my entire eyeliner and lipliner stash would fill a small shoe box. Yes, I know, this is shocking! 3 I think it’s a problem when you have back-up bottles of perfumes but you don’t remember buying them. And when you use these back-up bottles without realising you’re using the back-up bottles. And when you really have no idea that you’re using two bottles of the same fragrance at the same time. All you know is that the fragrance is always handy (Spooky – right?). You think “oh great, I did remember to take it out of my handbag and to put it on the dresser” (or the other way around). And then, at some point, you consciously take the fragrance out of your handbag to put it back on the dresser – only to realise the fragrance is already there. Now that’s another shocker, isn’t it? How do I intend to tackle these problems? First of all, I won’t be buying any more face masks. I’d like to say I won’t be buying any more until the end of the year, but I’m not sure I’ll stick to it. I think I can definitely commit to two months – and then I’ll see how it goes and I’ll take it from there. In regards to using the face masks – my husband (who loves a hot bath and a mud mask) will be happy to help me out! Step two is that I won’t be buying any more Essence eyeliners just because they’re so cheap. I think I can definitely commit to not buying any eyeliners – no matter what brand – until the end of the year. The fragrance thing is a bit more difficult. I have quite a few fragrances and I’ve identified several bottles which are near empty = down to their last 10ml or less. The Victoria Beckham Signature fragrance bottles are both down to about 15ml, and I’ll make it a priority to finish one of them this autumn. So keep an eye on my empties for the next few months as I’m expecting to finish several fragrances and body mists. Wish me luck! Are there any other beauty hoarders out there who wish to confess? If so, feel free to let me know in the comments. And thanks for reading!